sailboat. : Monday Wish List. 1. Dior Celebration Collection Make Up Palette for Lips. 2. ASOS Moving Bunny Chase Watch. 3. ASOS Gold Owl Compact Mirror. 4. Ted Baker Glitter Bow Cosmetics Bag. 5. Oysho Rabbit Print PJ Pants. 6. NARS Cactus Flower blush. 7. TIGI Bed Head Style Shots Epic Volume Shampoo & Conditioner. 8. Liz Earle Healthy Glow Cream blush. 1. How completely perfect is this Dior lip palette?! I'm not really one to lust over lip palettes, I always find them a little fiddly for on the go but the colours in this are so pretty and I've been wanting to try the Dior lip balm for such a long time. 2. I've been on the lookout for a new watch for absolutely ages but I always seem to be so picky. This one has little bunnies on, so in typical Jennie style I adore it! I like that it's really simple, I'm a huge fan of simple accessories that go with pretty much everything and it actually looks like its quite good quality for such an affordable price! 3. I'm a sucker for cute little mirrors, goodness knows I don't need another one but this little owl from ASOS caught my eye. It's super sweet! 4. Another thing I'm a huge sucker for is cute little make up bags and it's the glittery gold bow that got me with this Ted Baker cosmetic bag. I love the pink and gold colour combination, I always think those a shades that look super girly and sweet together and this would be lovely to take on a mini weekend break. Not that I'm actually going on a mini weekend break any time soon, but that's totally not the point! 5. Lounge wear is pretty much the only clothing style I'm wearing lately, I've been chained to my laptop with a million essays to write and I love to be comfortable. These PJ pants have bunnies on them. Yep, anything with bunnies and I'm there! 6. Cactus Flower cream blush from NARS is a super bright red shade, but a little tiny bit on the cheeks gives such a pretty flush and I'm a huge fan of red and red toned pink colours during this time of the year. I think they look so lovely! 7. I've been on a mission to use up all my shampoos and conditioners because I have way too many in my bathroom. I've been trying to decide which I will repurchase once they're all gone and at the moment the Epic Volume from TIGI line is one of my absolute favourites. They smell so yummy and although I don't notice a whole lot of volume from them, I feel they really cleanse my hair and leave it feeling super clean and hydrated. 8. I've been trying out the Liz Earle Signature foundation, (review coming tomorrow!) and I've been curious about the make up range for a little while, ever since reviews of the products started popping up on blogs. I've heard lots of lovely things about the cream blush range, all of the shades look so pretty and natural and I love cream products in the colder months! Let me know if you've tried any from the range & what you thought, I'd love to know! P.S. I'm slowly but surely replying to comments on my last post. Thank you SO much for all of your kind words, they really meant a lot and made me smile so much! Oh my god those bunny pjs are killing me with cuteness!!!! i love the dior lip palette, such cute colours! The rabbit watch is pretty adorable! I would definitely wear that! Oh my gosh, that Owl Compact is so cute! Definitely getting my friend it for Christmas!! I so need that watch - it's so adorable!!! It was the first NARS product I ever bought. Your wishlists are so bad for me! ohhh that nars blush looks lovely! it would look amazing on you beb!! LOVE that Ted Baker bag! The one in shell color looks fabulous as well. Oh my! 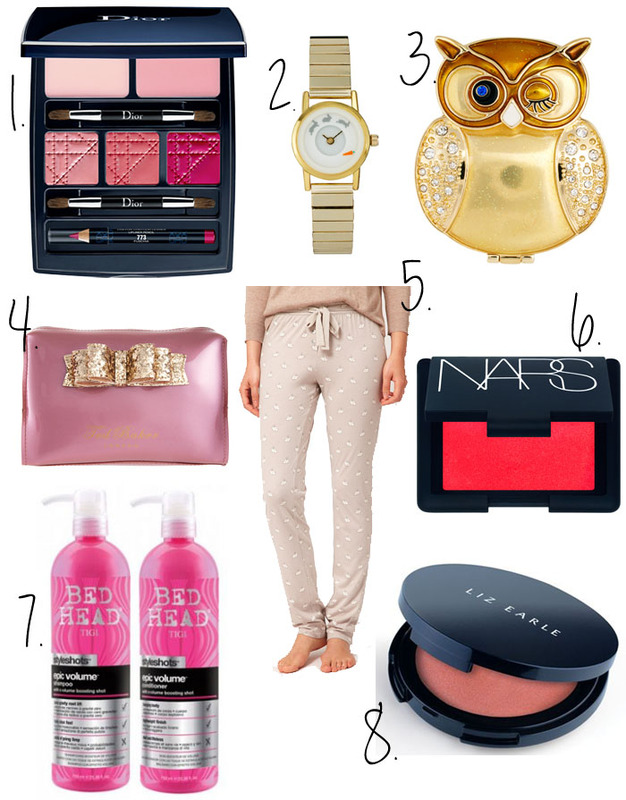 There's also a larger version, doubting which one I'd like better..
Lovely post, I love the look of that Dior palette ! Wow, that Dior lip palette is stunning, hadn't actually seen it before now. I've also got my eye on that Liz Earle blush, but there are so many things I now want for Christmas that it's getting slightly ridiculous!